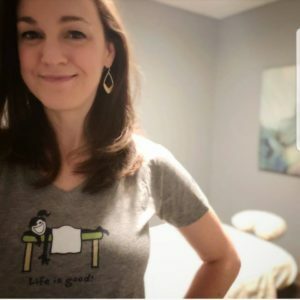 Kim Medeiros is a RI Licensed Massage Therapist (license # MT01613), practicing full-time since she graduated from the Connecticut Center for Massage Therapy in 2001. Kim’s work helps reduce and relieve pain and stress, and improves functional mobility and muscular recovery. Her massage technique utilizes an integrative approach of deep tissue, myofascial, and Swedish modalities. It is her goal to assist you in continuing to do what you love in life, whether it is to continue to play a sport, to be active with your children or grandchildren, or simply to be more comfortable in your body in day to day life! Kim is board certified by the National Certification Board for Therapeutic Massage and Bodywork (NCBTMB) and is an active member of the American Massage Therapy Association (AMTA). She is also a Certified Personal Trainer through the National Academy of Sports Medicine (NASM), and holds a Corrective Exercise Specialist Certification. She has accrued hundreds of hours of continuing education, and enjoys gaining further knowledge in health and wellness through reading, research, and connections with other healthcare practitioners.